BONUS! Also Includes a FREE Autodesk Fusion 360 3-Year Subscription. Fusion 360 is the next-generation tool for the next generation. GET FUSION 360 FREE FOR 3 YEARS! Students can create amazing designs with a modern, easy-to-use, powerful industrial and mechanical design tool like Fusion 360, and hone their skills to become tomorrow's engineers, product designers, and industrial designers. Note: After placing order for this free product, you will receive an email with a download link to access your free software. Also known as "additive manufacturing" or "stereo lithography," 3D printing is often depicted as a mysterious and seemingly magic process. 3D printing turns computer models into real physical things. It takes different materials, from biodegradeable plastic filament PLA to ABS plastic to Nylon, melts it into thin layers onto a surface, moves up and prints another layer. After layer upon layer, you are left with a physical object. 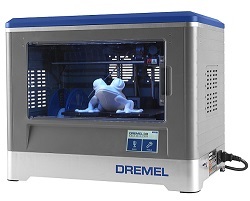 You can use 3D modeling software such as Solidworks, the free google sketch up program, or go to thingiverse.com, download free things that people have already created, and print them out in your own home or office or classroom. Three-dimensional printing has been widely used in industrial contexts for more than two decades. It is only recently, however, that 3-D printing has captured the public eye. Greater refinement and reduced cost of the technology are primarily responsible for this phenomenon. 2) Three-dimensional printing allows businesses to construct working models in just hours instead of days or weeks. 4) Generating prototypes with 3D printers is much easier and cheaper than making molds. 6) Certain three-dimensional printing methods enable the production of objects with excellent surface features. This makes it very easy to create construction models or prototypes for a wide variety of projects within many industries. 8) The objects obtained in many types of 3-D printing are quite long lasting and durable, as they do not absorb moisture or warp over time. This special printing method allows you to display 3-D models to customers that are fully functional and look very much like the real thing. This enables you to demonstrate how a product operates in a straightforward fashion, as opposed to a model that can be viewed only with computer assistance. a. A copy of your dated proof of purchase (please keep a copy for yourself). b. A written statement about the nature of the problem. White is clean and light and is great for items that evoke elegance and simplicity. Black is the darkest color and is great for items that evoke sophistication and style. Blue is breezy. Blue is energetic. And blue is one of the most popular colors out there. Orange is an energetic color that is playful, lively, and bright. Gold is the color of wealth and riches. It is the color of success, achievement, and triumph. Green is bright and refreshing. Green is the color of shrubbery, grass, and vegetables. Natural White / Translucent filament gives your built models a unique sparkle. Pink is a youthful, fun, and exciting color that is symbolic of happiness and hope. Purple is a regal color, favored by royal families in ancient times. Red evokes warmth, energy, and passion. Silver is sophisticated, high-tech, and modern.